This post originally appeared on Sidewinder.fm, Hypebot, Evolver.fm, Midem.com and a few other place. It only takes a quick glance at your favorite social network to see that people love sharing their favorite music. But the people on the receiving end are often less than enthused, either because they don't care for your taste or they wind up following a link that doesn't play. With everyone using multiple and different music services, sharing has become ineffective, and worse, spammy. After a few clicks on links that don’t work, people just stop clicking. For the sake of everyone involved, a music interoperability movement is required — both to enable the creation of new compelling experiences, and grow the online music market as a whole. In many ways, the online music market resembles the text messaging market in the mid '90s. When mobile carriers first introduced text messaging, users could only exchange messages with other subscribers on the same network. Unsurprisingly, this constraint slowed user adoption since it's not appealing for a carrier’s customers to try and influence their friends' and family's choice of providers. At first, carriers viewed this sort of lock-in as a promising tactic for acquiring customers, but they came to realize that in order for text messaging to provide real value to their customers, they needed to support communication between friends on other networks and territories (often where their services may not be available). During these early days, the SMS market was virtually non-existent, with an average of only 0.4 texts sent per user per month. A few years later, SMS gateways enabled text messaging interoperability across carrier networks and instantly the value proposition became much clearer for consumers. Subsequently, texting adoption and usage exploded. By 2010, SMS had become a $115 billion a year business. There were many factors that played into the growth of the SMS market, but I’d argue that without network interoperability at its core, the rest of them would have been moot. You likely look back at those texting limitations and shake your head. Yet this is the current state of online music. Rdio, Spotify, Mog, Deezer, Rhapsody, Pandora... all of these users trapped in their own respective silos with no way communicate to each other. If you use Rdio, and I use Spotify, we cannot easily share our music tastes in a compelling way. Each service seems to be hanging on false hopes that their links will serve as an incentive to get you to switch to their service. But what if you are in India and I am in Germany? 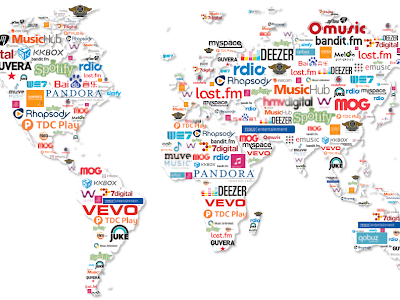 The digital music market is extremely fragmented in each territory, with no single provider having global licenses. Even the world’s largest music service, YouTube, doesn't have music available everywhere. When it comes to universal accessibility across a wide breadth of content, piracy is the only game in town. We all live in a global economy but are continually hamstrung by the constraints imposed by territorial music licensing and availability. To grow the online music market we need to take a step backwards philosophically, and a step forward technically. Instead of unrealistically hoping for a single service that licenses everything for everywhere, the market needs to move to a music interoperability model where music is fulfilled by a mesh network that encompasses all of the available legal sources for each individual user. 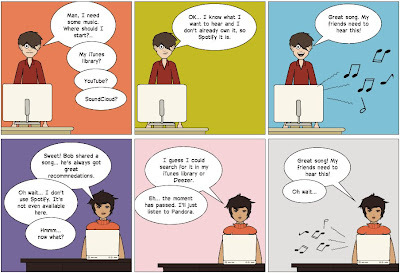 The net effect is the creation of a sort of musical babelfish; a translation layer that allows users from around the world to seamlessly share music with each other. Much the same way SMS gateways now enable text messages to reach virtually anyone, anywhere, on any carrier. Such a solution would remove the complexities and roadblocks to creating a global sharing, curation, and discovery network. Just as importantly, it would also open up new opportunities for more niche music providers that could focus on going deep, instead of broad, on their catalogs. With links that work seamlessly across all of these sources, users could build their own licensed streaming catalog that has nearly everything they want with nothing they don’t. An interoperable approach would ultimately stimulate the legal music market, as users won't have to go through the mental gymnastics of trying to figure out which is the "right" provider. They are all "right" since they all become interoperable at the metadata level. In addition to interoperability, this would enable music data portability and drastically reduce users’ switching costs between providers — or across multiple niche providers. By reducing a user’s risk of joining these services, it makes the purchase decision much simpler, thereby reducing the friction of getting people to join these services in the first place. As you can imagine, there is some hesitancy from companies who may view music data portability as a threat. Some may think of your playlists and music libraries as the primary way to keep you locked into a relationship with them. For example, Sean Parker recently extolled the benefits of “trapping user playlists so they don’t leave Spotify.” There are many ways for services to compete, but lock-in has historically never been the solution. I'd argue that interoperability is the key to growing the subscription music market beyond the level it has been stuck at for the last five to ten years. One of the promises of the social web was to grow the online music market, but in reality, it may be holding the entire market back. Communication and curation on a global medium, such as the Internet, is only powerful if everyone involved can understand each other. A thriving and innovative marketplace is dependent on lots of players, approaches, and competition. Otherwise we will be headed to standoff between a single dominant player and the rights holders, trying to hold each other hostage in the next round on license renegotiations. In that scenario, the consumers all lose. The beauty of technology is that it can facilitate extremely complex transactions. The challenge is to present those complexities simply to the users. In the good old days, when I told a friend about a great song or album, I didn't say, “You should go to The Record Exchange and buy the new Screaming Trees album with 'Nearly Lost You' on it." No, I'd simply tell them the name of the artist and track and let them decide how and where they were going to acquire it. This “old school” transaction model is one I believe we should all strive to return to, and by demanding and supporting music interoperability, we can achieve it. And just maybe save the online music market along the way. UPDATED: this post prompted a follow-up interview with Sidewinder.fm. Your point about the attention economy is a good one. I don't want to have to pay attention to what I am listening to - I just want to listen to it. That's one of the reasons why I think there is nothing better than a top notch terrestrial radio station. You get many different voices (DJs) playing a general type of music that you are looking for (good examples: KMHD here in Portland, which is a jazz station; Georgia State's 88.5 in Atlanta). Sure, you'll get the occasional clunker, but they help you discover new music, yet play a wide enough breadth of music so that you don't have to pay attention and change the Pandora channel (which always ends up with every song sounding the same), or finding a new musician on Spotify. Terrestrial radio, particularly stations below 92.0, are stations curated by people who care about music.